72 Inch Hopper Broom Rental Attachments – Sweepster, is available for rent in Rochester NY, Ithaca NY and the entire Western New York region from the Duke Company. 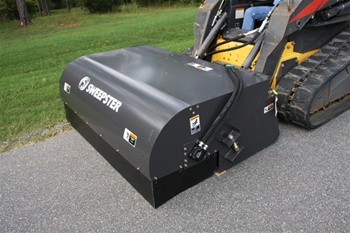 This 72 inch, hopper broom attachment is manufactured by Sweepster, is specifically created for skid-steer loaders and is equipped with quick change capabilities. The broom sweeps in multi-directions for maximum productivity – straight: to pick-up dirt, and backwards to pick-up construction debris, gravel, rock, asphalt and other materials.